Super fast shipping , 2.5 days total. From South Cal to Nort ..
- Brand new! Sealed packages! 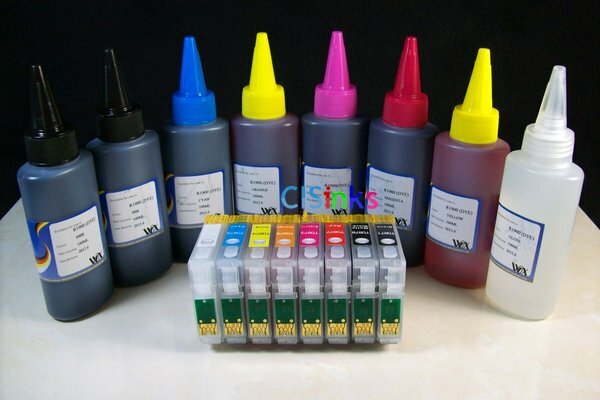 - They are Pre-filled with 15ml of ink in each cartridge! - These cartridges are refillable. So, they can be refilled over and over again! You will never need to buy cartridges AGAIN! - These Cartridges Come with New Auto reset chips that reset automatically! All you have to do is remove the rubber plug on the top of the cart, inject ink until full, put the rubber plug back in place, reset the chip, and you are ready to go. No more fighting with the foam trying to get a good nozzle pattern. Normal ink cartridges limit the number of prints by presetting the maximum number of prints on the “Smart Chip”. Please attention, refillable cartridge should be used by one set, not for individually using or mixing with other cartridges! Fast Ship from California, USA!